David Morales in AARP Studios, where elements of Life Reimagined and Takei’s Take programming are produced. David Morales wasn’t looking for AARP when it found him. He was Discovery Channel’s principal attorney for all of Latin America and the Iberian Peninsula, which involved him in e-commerce and digital platforms. Serendipitously, AARP needed a technologically versed expert on its legal team—both for its print-to-digital transition and an expansion of its media outlets. 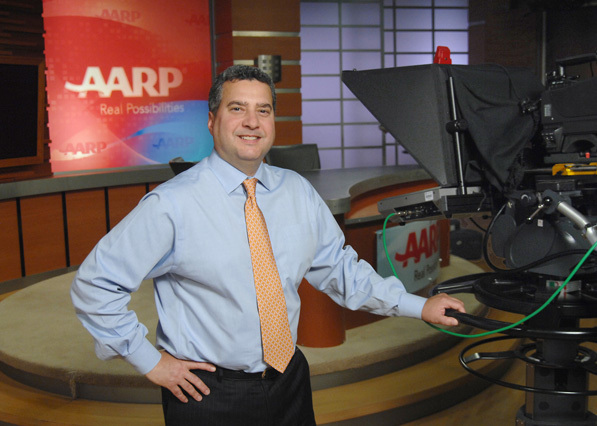 This resulted in Morales taking on complex, challenging projects, rooted in AARP’s advocating nature but branching out in numerous, updated ways. He discusses some of these with Hispanic Executive. Q AARP has a history of trailblazing for the 50-and-over community. How is it maintaining that reputation today? With people no longer retiring at 50, we want to make sure they have the tools and resources to help discover possibilities, prepare for change, and make important decisions about their future. One innovative way we’re doing that is with Life Reimagined, a subsidiary of AARP that helps people navigate various life stages, challenges, and obstacles through programs, seminars, applications, and courses. We established the Life Reimagined Institute, which brings together thought leaders such as Richard Nelson Bolles, author of What Color is Your Parachute?, and Richard Leider, author of The Power of Purpose and Repacking Your Bags. They collaborate with Life Reimagined to create curriculum that the everyday person can use to navigate obstacles. Another initiative is our ongoing relationship with George Takei. He is the star of our YouTube series Takei’s Take, sharing his point of view, tone, and wit about issues and trends related to technology and social media. Q Why is it important for AARP to digitize and innovate on the Web? For AARP, digital engagement is critical to our long-term growth and success. We want to meet our members and the public where they are, and they are increasingly moving online for tools and information. A lot of nonprofits see us as being innovative and ask us how to use social media, sponsorships, and other mediums to deliver their mission. Q How is AARP responding to that online migration? AARP recently released RealPad, a tablet created with the 50-and-older generation in mind. We’re also preparing to launch AARP Studios, which will be dedicated to delivering fully integrated digital video and social media content to our members. So we’ll continue to make our voice heard on multiple platforms. Q Outside of social media, how does technology figure into AARP’s future? AARP will continue to make an impact with its members and the over-50 population by offering technology training and workshops for understanding mobile technology and applications. Through AARP TEK (technology, education, and knowledge), in partnership with our state offices, individuals have access to tools that can help them understand how to navigate their smartphone or any other device. We also offer information on fraud and identity theft. It is important for people to feel comfortable enough with technology to know how to protect themselves. Through our Mentor Up program, younger individuals train older people how to use technology. The program has been hugely successful. Q What trends do you see developing within the nonprofit sector? I think you’ll see more strategic partnerships between nonprofits and for-profit organizations—actual joint ventures. Typically, nonprofits have the expertise and for-profit organizations have the financial capabilities. There are many ways to structure these deals, but the key is to avoid a disproportionate share of the risk and reward between the parties and the nonprofit using its assets to improperly benefit the for-profit partner. Q What’s one great thing about being part of AARP’s legal team these days? AARP Foundation’s relationship with NASCAR comes to mind, as we are the first nonprofit to sponsor a race car. Our collaboration with Hendrick Motorsports and Jeff Gordon’s Chevrolet provides much-needed support and awareness that helps raise money and collect food (at race events and across the country) to support local hunger-relief organizations, in particular serving older Americans. “Drive to end hunger” is the theme, and we have been very effective with food collections, raising money, and building awareness.